Today I will be joining some extremely talented friends for the Styled + Set Summer Entertaining Blog Tour hosted by Lory at Designthusiasm. If you are visiting from So Much Better with Age, welcome and thank you for stopping by! 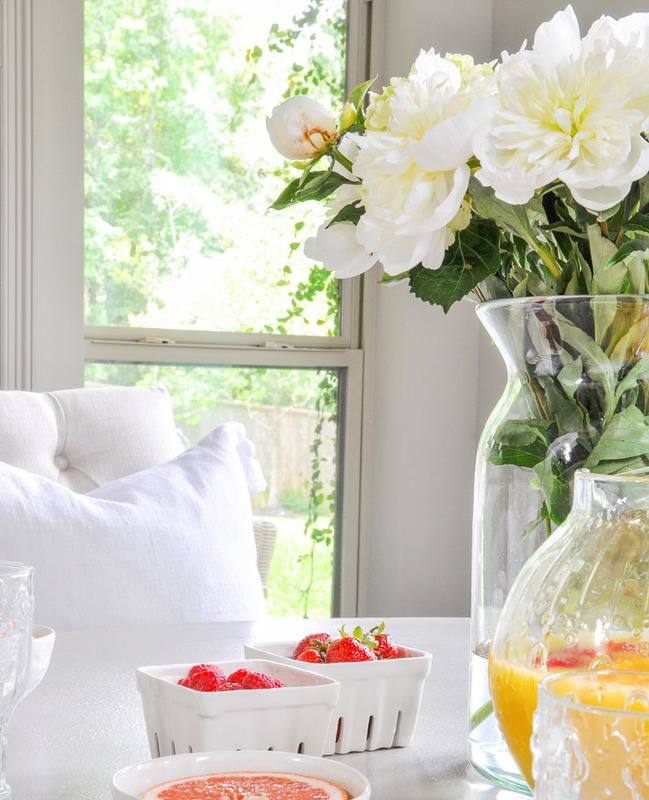 Below you will find 5 tips for an elegant summer breakfast. Your family and guests will feel extra special. Around our home, summer breakfast is usually a casual affair consisting of grabbing something quickly as the morning is a busy time for our family. However, there are times when I like to sit at the breakfast table as a family. First, let’s focus on a few things which are easily accessible and will make this breakfast a bit more memorable. 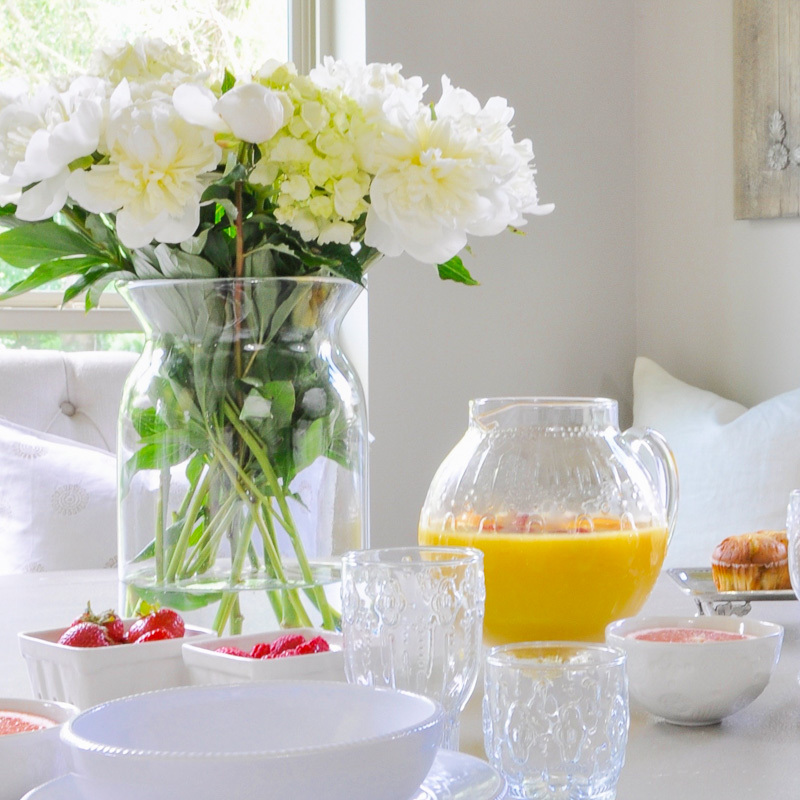 Casual elegance doesn’t stop in the breakfast room. How does summer breakfast in bed sound? Let’s face it, is there a much better way to begin your day than breakfast in bed? Now, of course breakfast happens before the bed is made for the day. Below, the tray and the bedside table are adorned with fresh flowers which are readily available and most affordable this time of year. 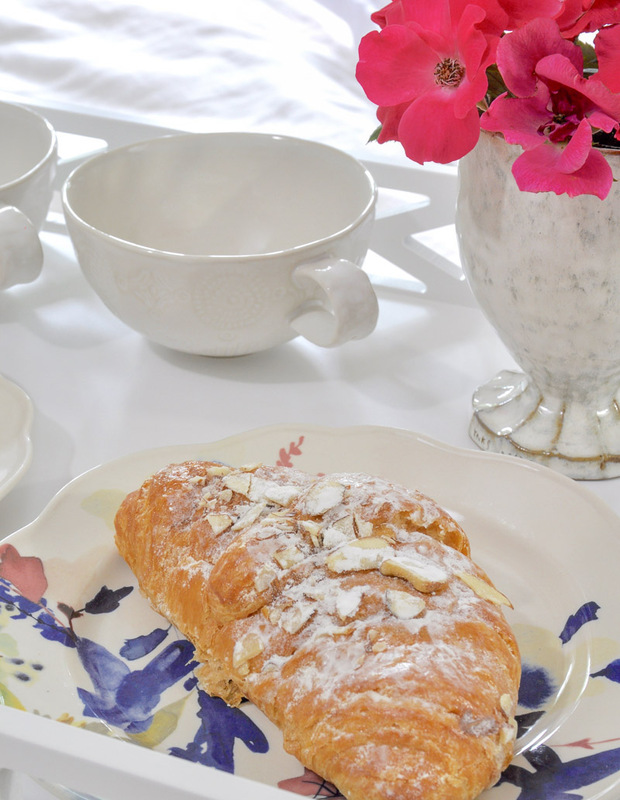 Moreover, the tray boasts seasonal fresh berries and tasty almond croissants. In our home, the two cups would have hot coffee and hot tea awaiting us. Lastly, don’t forget the flowers as they are key elements to the setting. The goal is to encourage those who are dining to relax and stay a while. I know there are times in our home when we do not slow down enough. It’s nice at times to enjoy a summer breakfast at a more leisurely pace. Outside of the bedroom, first and foremost, I like to ensure I have comfortable chairs at the ready. Additionally, I like to keep pillows on each chair and a few more on a bench for added comfort. The ones you see below are from my friends at Pom Pom at Home and they have the cutest little tassels. And by this, I mean it doesn’t have to be those special dishes. 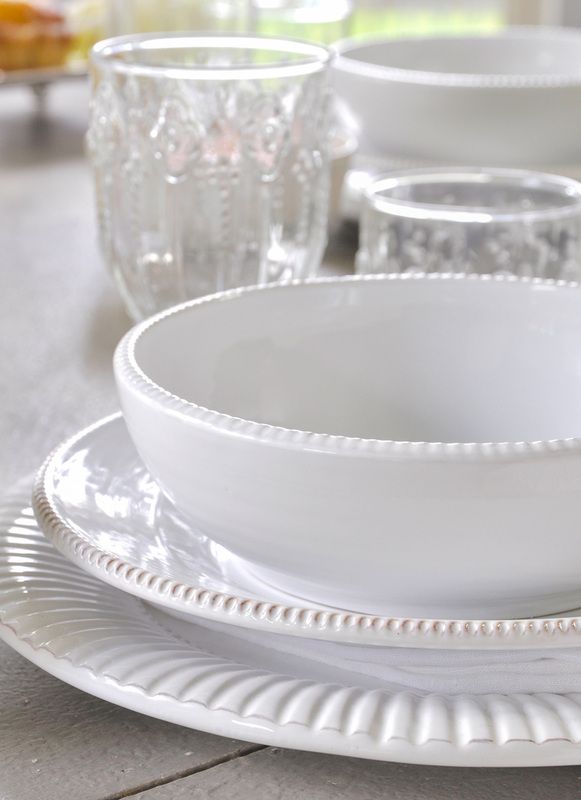 Below, I used mix and match dinnerware in a white palate in the breakfast room. 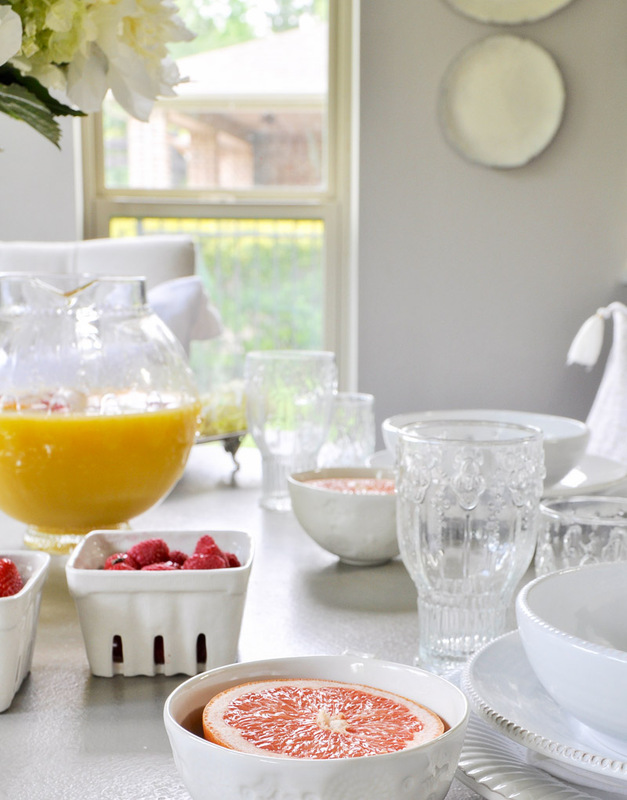 Now, this simple and elegant summer breakfast feels a little extra special. In the bedroom, these floral plates are the star of the show. The surrounding white dishes helps them stand out. 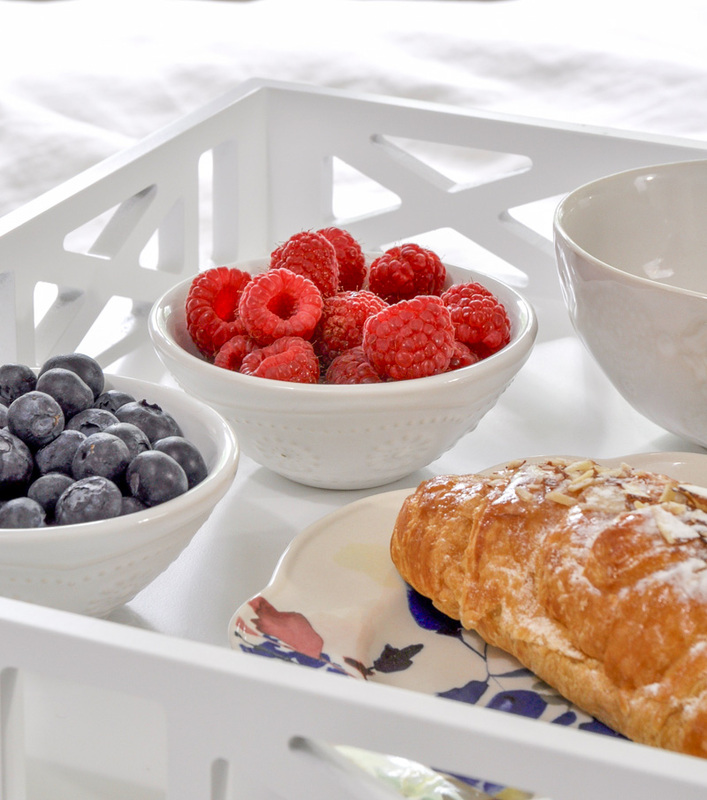 I love to use ceramic crates and little condiment bowls for fresh berries. Can we jump back to the table for a moment? Glass is beautiful in the summer and this pretty pitcher and glassware are favorites of mine! A clear pitcher is used for the fresh squeezed orange juice to showcase it’s summery color. Choose seasonal food for freshness. My husband and I love having breakfast at hotels when we travel. Everything is typically presented so well and several employ a “farm to table” component to their menu as they utilize local growers when possible. One of the best aspects of summer entertaining is the abundance of flowers. Many are in season and therefore the pricing is as good as it will be all year long. Be sure and take advantage of not only your local florist, but those right in your own yard. Paint color is a custom blend. I hope you enjoyed my tips today! If so, I’d love for you to subscribe to my newsletter. Now, please continue on the tour by visiting Courtney from French Country Cottage. Courtney’s website is one of my favorites and I know you will just love it. Her designs are incredibly inspiring! 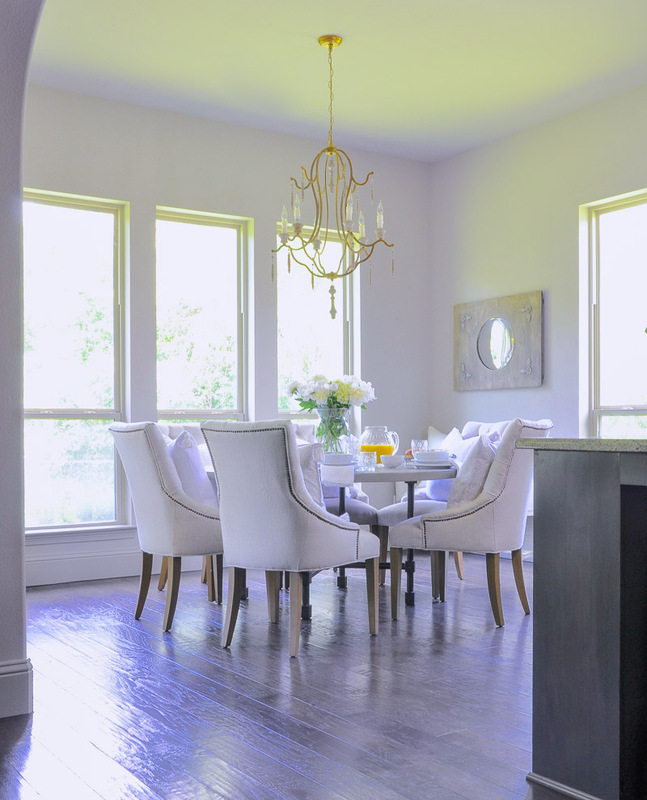 From there, you will find additional posts by some of the best home stylists around! Great tips for a wonderful morning start! Love your home and I especially love the mirror above your table. So pretty! What a gorgeous post, and a sensational line-up. I’m ready to go blog gazing now!! Croissants in bed… what could be more delightful!!??! 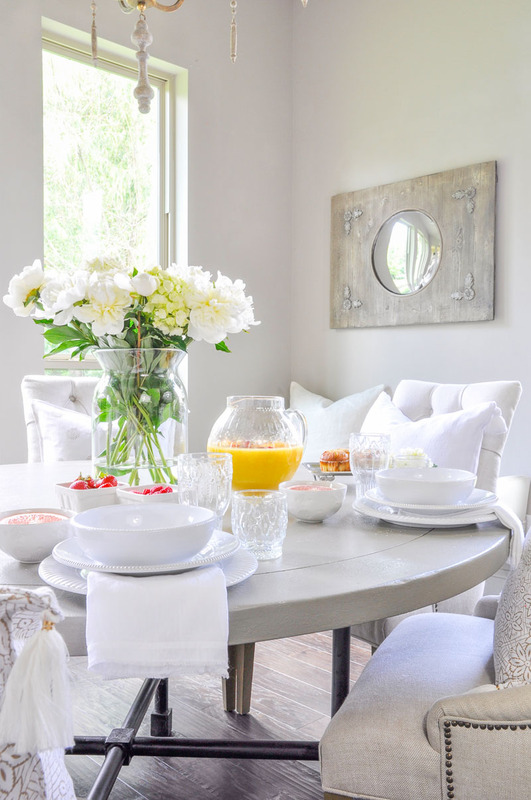 Love your beautiful crisp white table, too, as it imparts a feeling of fresh promise to the morning. Lovely post! It’s so gorgeous, Jennifer. Your master bedroom is stunning and I love your breakfast table you set. So great being on this tour with you. Absolutely charming Jennifer! Love the breakfast in bed ideas- so fun! Breakfast in bed?! What could be better! And in this pretty bedroom, it’s just perfection! Loved this post Jennifer! It’s such a beautiful post, Jennifer! I really love those glasses. You always incorporate the prettiest details. And, the fresh flowers are such a nice pop of color too! Jennifer, I love your step by step descriptions and beautiful photos! I have a small concern about one of the tips – flowers. I and my daughter are allergic to furry animals and some plants, so in my experience, it is always good to ask guests if they are not allergic to something before placing flowers in the breakfast table?